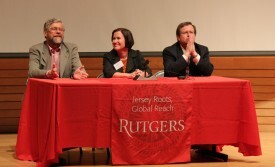 Share the post "Rutgers Energy Institute Presents Seventh Annual Symposium"
Symposium speakers Roger Prince, Dian Grueneich, and Steven Koonin. Commission) who presented “Recent Innovative Regulatory and Policy Initiatives at the State, Federal, Regional and Local Levels;” Steven E. Koonin (director, New York University Center for Urban Science and Progress) who presented “Energy: Technology, Policy, Social Science, Informatics;” Roger C. Prince (ExxonMobil Research and Engineering Company) who presented “The Outlook for Energy: A View to 2040;” and Daniel P. Schrag (Sturgis Hooper Professor of Geology at Harvard University; director, Harvard University Center for the Environment) who presented “The Challenge of Reaching a Low Carbon World.” Educational video presentations including slides can be found on the REI website. L-R: REI Director Paul Falkowski (Institute of Marine and Coastal Sciences); Roger Prince; Dian Grueneich; Steven Koonin; with REI Energy Contest winners Mikael Kuhn & Brittney Lindley (1st place); Josh Roe & Brian Doyle (2nd place); and Neil Ramchandani & Matthew Ambrusch (3rd place). REI Associate Director Bob Kopp is at right.